Trying to establish yourself at a club as successful as Bayern Munich must be an intimidating prospect for any footballer, yet on Saturday new midfield signing Leon Goretzka went a long way to doing just that. Having featured as a substitute in the DFB Cup and in the Matchday 1 victory over Hoffenheim, the 23-year-old made his starting debut for Niko Kovac's side at VfB Stuttgart following his summer move from Schalke. He was outstanding in the 3-0 victory, scoring the opener and setting up Robert Lewandowski for the second in a performance brimming with drive and verve. "I'm very happy," Goretzka told bundesliga.com at full time. "I'm not used to coming off the bench, so I was all the happier to play from the off. I was really motivated because it was my first Bundesliga start and I wanted to prove to my team-mates that I could help the team. I tried to play as well as I could today and I think I succeeded in doing so." That is quite the understatement. Aside from having a direct hand in Bayern's first two goals, the 16-time Germany international covered more ground than any of his team-mates (7.10 miles) and was a constant thorn in Stuttgart's side, peppering Ron-Robert Zieler with five attempts at goal over the course of the match. By way of comparison, the hosts only managed four shots collectively over the entire 90 minutes. 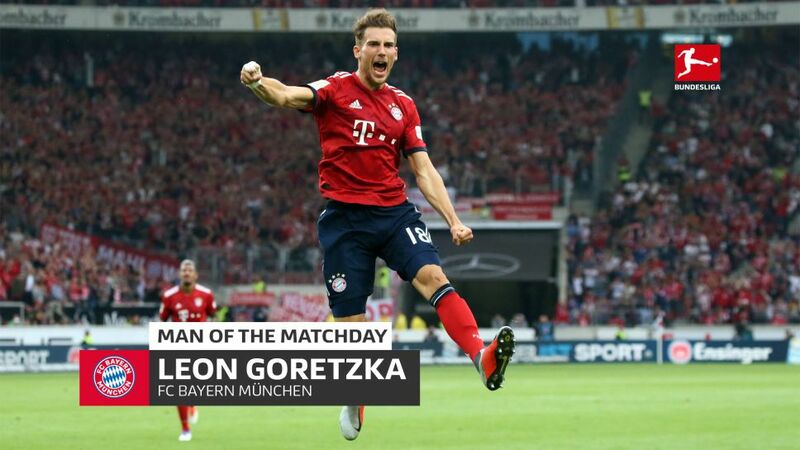 Even before netting his maiden goal for Bayern, Goretzka had served notice of his threat in the final third, arriving late into the six-yard box to beat Benjamin Pavard to Joshua Kimmich's cross in the 23rd minute, only to see his header go narrowly wide. He put another header just off target in the second half too, again meeting a Kimmich cross with a late run into space. Those efforts may not have gone in, but they did not go unnoticed by his colleagues. "Leon Goretzka's a very good player who's in good physical shape and he also always tries to get into the box," said Thomas Müller afterwards. "Against opponents like Stuttgart you need that movement, so I'm sure he'll score for us many times in the future." Coming from Mr. Raumdeuter himself, a man who has made a career out of elusive movement and perfectly timed runs, that is quite the compliment. It is also telling that Goretzka only completed 19 passes all game – the same amount as Manuel Neuer – but the fact he was so influential speaks volumes for his efficiency and intelligence at being in the right place at the right time. Admittedly, it is still early days to assess Goretzka's impact at Bayern, but if this is what he can do on his first full start, the prospect of what he'll be like a few months down the line can only bode well for Kovac's side.